For most people, mono-functional video converter is not enough today. More and more people would like to add something new into their videos. Thus they need some video editing tools to meet their needs. The one which can ensure quality with less loss and support HD video files will be perfect. So HD video converter with more useful features is necessary. 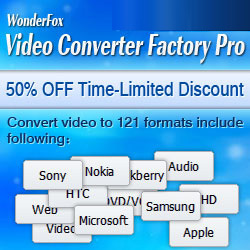 And now everyone can get a professional video converting program as a Xmas gift at WonderFox Xmas Promotion. HD Video Converter Factory Pro, a professional video converting program integrated with high-quality video converter, powerful video editor (merge, clip, crop and special effect) and video downloader, is just the right choice for you to deal with your Xmas videos. Its editing function is still in update which could satisfy users' ever-changing requirements. Besides the powerful converting and editing functions, HD Video Converter Factory Pro also supports Multi-CPU and Hyper Threading, it offers up to 50X real time video converting speed, which will help you convert video in a high speed. This video converter is equipped with powerful functions but costs little ($29.95). Furthermore, it is free to try. User can apply it to convert video files and download video files less than 5 minutes. As for WonderFox AVI Video Converter, it is an application for windows operating system that allows users to easily transfer video files between a wide range of popular video formats with high quality and fast speed. By using the tool, users can convert multi-format videos to be compatible with many devices. Just like any other WonderFox applications, it highlights itself with an intuitive and well-organized interface. Share this giveaway; everyone can have a chance to win life-time upgraded license code of WonderFox’s major product – WonderFox DVD Video Converter. What’s more, WonderFox Soft also has a daily discount offer with different Windows programs giving out continuously. You can visit the Facebook page to get more promotion information.